As part of Arable Horizons hosted by Farmers Weekly, University of Lincoln Professors, Tom Duckett, School of Computer Science / lead for Lincoln Centre for Autonomous Systems and Simon Pearson, Founder of the Lincoln Institute for Agri-Food Technology (LIAT), will be speaking at the National Space Centre, Leicester, on 26th April 2017. Arable Horizons is a series of 5 interactive talks, hosted by Farmers Weekly and in partnership with Syngenta, which cover some of the most exciting and innovative agricultural research; from robot-assisted farming to gene-edited crops. Exploration into the development of higher yields and cheaper production are key themes, as well as bringing a greener and more stable future for British agriculture. 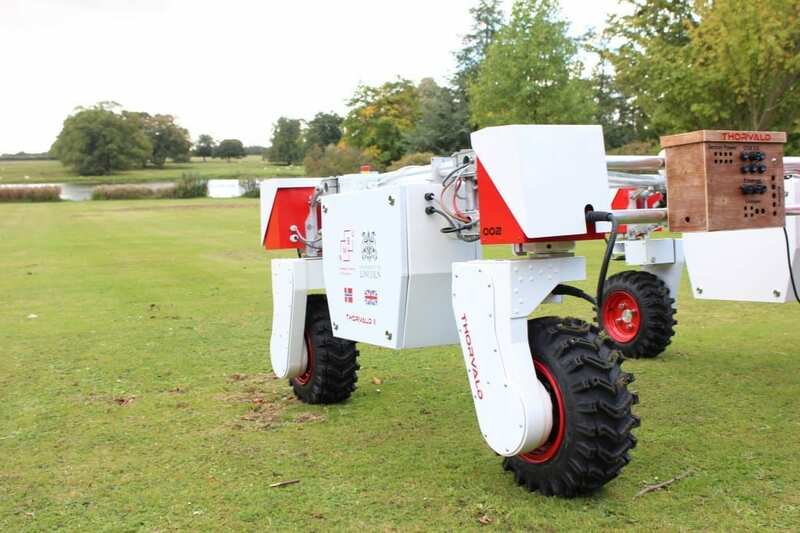 The topic, “Robotics, automation and associated technologies”, will discuss exactly how robots and other related technologies will make UK farming more efficient than ever, whilst reducing the cost of labour and pesticides. Pictured is Thorvald, LIAT’s Agri-Robot. UK agricultural researchers, scientists and agronomists will be in attendance, as well as the nation’s farmers. The event will be a fantastic opportunity to chat and network with agri-robotic professionals Weekly staff and guest speakers Prof Tom Duckett and Prof Simon Pearson. You can register for the talks here. Drinks and nibbles will be provided for guests on arrival, with the chance for delegates to network before the formal start of the evening. Karl Schneider will introduce the evening: the idea behind the project, the topic, speakers and guests, partnership with Syngenta, and opportunities for interactivity throughout the talk. (40 mins) Prof Tom Duckett presents ‘Robotics, automation and associated technologies’ Arable Horizons talk. University of Lincoln professor and Head of the Lincoln Centre for Autonomous Systems Tom Duckett presents an introductory overview of the current use of robotics and associated technologies in agriculture and what some of the recent/future advances could mean for UK farmers. Prof. Duckett will talk about some of his own research and how we can work with other industries to make the integration of new machinery and technology into the farmers’ everyday toolkit as simple and productive as possible. (25 mins) Prof Simon Pearson presents a talk on the most exciting future agricultural technology projects. University of Lincoln professor and Founding Director of the Lincoln Institute of Agri Food Technology Simon Pearson presents his talk on some of the specific projects focussed on novel robotics and machinery, their integration into the UK agriculture industry and what it could mean for the farmer on the ground. Karl Schneider will chair the interactive session in which the panel will take questions on the topics of robotics and associated technologies from the audience, both from guests in the room and those watching online. A Syngenta expert will present on what they as an organisation are doing in the area of robotics and machinery and how their research could help farmers tackle some of their most common and costly issues.